The original Star Trek captain thinks you need to get to know him a little better. William Shatner has been accused of having a big ego in the past, but now he's taking it to the next level by directing and executive producing a documentary about himself. The documentary, which has a working title of The Captains, will look at Shatner's early life in Canada and his rise to fame as Captain James T. Kirk in the original series of Star Trek. 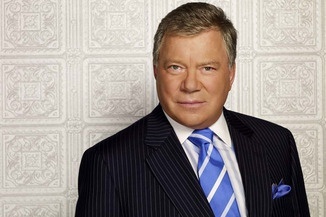 The Captains is a joint production between Shatner's production company Melis Productions, Ballinran Productions, and western Canada's Movie Central channel. The Captains is scheduled to begin production next month, for broadcast in winter 2011. I have to admit, if this was anyone other than William Shatner, I'd be rolling my eyes pretty hard now, but somehow, for him, this seems like a perfectly reasonable move. I can't decide if I want it to be unintentionally hilarious, or just informative, but either way, I'm kind of curious about seeing it.